The Kai Ken (甲斐犬 ,also called the Tora Inu or Tiger Dog) is a breed of dog that hails from Japan where it is a national treasure and has been bred for centuries. It is an extremely rare dog even in its native land and is related to the Spitz dog type. The Kai Ken is a medium sized dog with a wedge shaped head and prick ears. Males are typically 18 to 22 inches at the shoulder, while the females are slightly smaller, 17 to 20 inches at the shoulder. The tail may be curled over the back, or carried in a sickle position. Limbs should be strong and hocks should be well developed reflecting the dogs' history of mountain life. 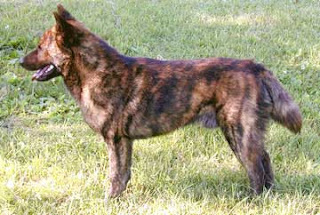 The coat is of harsh texture, medium length, and black or brindle in color. Its coat could be red or black at the "background". The red is the Aka-tora, the black is the Kuro-tora and between them, the Chu-tora. The Kai Ken is intelligent, agile, alert and brave. They are naturally hunters and make good guard dogs, being reserved with strangers but loyal to their families. They are friendly, often good with children and are not usually aggressive towards other dogs. The Kai Ken is considered to be the most ancient, and purest dog breed in Japan. It was developed in the isolated district of Kai (Yamanashi Prefecture) as a hunting dog. Kai's were used to hunt boar and deer. This breed was designated a national monument in Japan in 1934. * Many Kai Kens play important roles in the Yoshihiro Takahashi series Ginga: Nagareboshi Gin and its sequel, Ginga Densetsu Weed, including the brothers Kurotora, Chutora, and Akatora. In the sequel, Ginga Densetsu Weed, Kurotora's son, Kagetora, stars as an important character, with his less prominently featured brothers, Harutora and Nobutora, and cousins Dodo, Burukin, Shouji, and Shigure. * Another Yoshihiro Takahashi manga, Kacchu no Senshi Gamu featured a villainous Kai Ken named Gama.